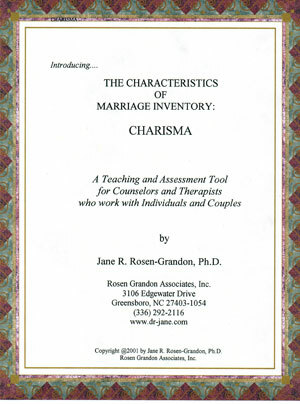 Counselors, social workers, and marriage & family therapists: Now you can earn CEUs while training to use the CHARISMA Inventory in the comfort of your own home or office. Upon receiving your order, your CHARISMA package will be delivered to your door. Included in this program is a continuing education examination with instructions for earning your 3 hours of Continuing Education Credits (0.3 CEUs). Rosen Grandon Associates, Inc. is a approved by the National Board for Certified Counselors to offer continuing education activities for National Certified Counselors. We adhere to NBCC Continuing Education guidelines. NBCC ACEP #6174.